Some books are able to take you to a place, show you around, and make you feel like you are right there experiencing it with the characters. The authors descriptive details show you the scene and then you are right there with the characters going through the dialog. 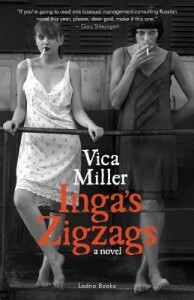 Inga’s Zigzags took me all over New York, Moscow, St.Petersburg (the Russian variety), London, and Miami’s South Beach. I am so happy I was able to get to read this book. I needed a vacation. This book is a gem. Inga is a woman coming into her own. She is not a flawless heroine or a damsel in distress. Inga is learning the hard way how to get through this life. She is a foreigner in almost every place she goes. She is recently divorced and returns to her native Russia after 10 Years in New York. She is not the same, and her native land has certainly changed. She gets involved with a lesbian couple and then, well…. I don’t want to spoil it for you. Inga makes some mistakes and makes some choices while guided by her heart. The journey that Inga takes is one of self discovery and sexual awakening. This is not erotica in its truest form, but you can bet there are some racy scenes. Admittedly, this book may not appeal to everyone. It appealed to me. I loved this whole book until I got to the last chapter. I hated the last chapter. I can see that the book needed closure but the last chapter jumped ahead so far I feel like this last bit of adventure would have been worth reading, as well. Especially since it is when Inga finally found her contentment with what she had. This lack of details killed me. By the second page of the last chapter I wasn’t hating it anymore, I just felt a bit robbed of the story. The author does a great job of writing exactly the same way throughout the book. Descriptive when it needs to be, showing feeling, and then some dialog. The book skips ahead at times and I felt like the author zoomed in to the parts when it really mattered. The whole story is written in first person, almost like a memoir. It is nice to be inside someone’s head for a while. I enjoyed the way Inga thought and the play on languages.